The Non-Destructive Evaluation (NDE) and Testing Facilities contain state-of-the-art NDE laboratories including microwave/millimeter wave, acoustic/ultrasonic, X-ray, thermal imaging, optics, and eddy current for health monitoring of materials and components used in aerospace, defense, and power generation (fossil and nuclear) industries as well as for medical and scientific research. Argonne National Laboratory has long-standing and extensive expertise in the nondestructive testing and evaluation of components for nuclear and fossil power plants, for automotive and military equipment, and for aircraft and the space shuttle. Argonne scientists and engineers work closely with colleagues from industry and other government laboratories to develop new techniques and assess the reliability of conventional and emerging nondestructive technologies and methods to detect defects in metals, ceramics, alloys and advanced composite materials. A wide range of Argonne-developed technologies, including electromagnetic and acoustic methods, are used for in-service inspection of nuclear power plant components, such as tubing, piping and pressure vessels. Argonne’s expertise and unique nondestructive evaluation (NDE) facilities are expected to play a leading role in developing and demonstrating inspection technologies for advanced nuclear reactors and their components. National user facilities such as the Advanced Photon Source, Intense Pulsed Neutron Source and the Electron Microscopy Center, all located on Argonne’s campus, have been used for NDE of advanced ceramics. For optically translucent engineering materials - including such structural ceramics as Si3N4, SiC, Al2O3 - optical coherence tomography is used to detect near-surface defects. Advanced X-ray computed tomography techniques have been developed for high resolution volumetric imaging of engineering materials. 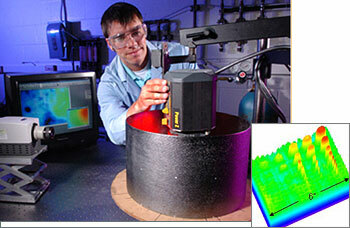 Phased array ultrasonics is used extensively for component inspection. Pulsed thermal imaging techniques have been developed to probe internal material properties and structure and to detect surface and subsurface defects. Pulsed thermal imaging systems can determine thermal property distribution in three dimensions, detect defects, and determine sizing. Specialized techniques are also being developed for imaging of multilayered structures. Confocal microscopy and polarized laser scattering are used to detect subsurface flaws in ceramic components. Electromagnetic testing methods are employed to inspect conductor and semiconductor materials. Software tools have been developed for efficient, automated and reliable data analysis. Argonne is a leading research institution in the field of MW sensor technology. Both active and passive MW/MMW sensing techniques have been developed for NDE of composite materials, including ceramic components. ADVANCED THERMAL IMAGING – Advanced thermal imaging technologies use infrared imaging of surface temperatures to determine a material’s internal properties and structure and to detect defects or damage.